Sir George Clausen (1852-1944) was a significant figure in nineteenth and early twentieth century British art. He was a notable exponent of English Impressionism and a founder member of the New English Art Club. Born in London, the son of a Danish decorative artist, he attended the South Kensington Schools and subsequently worked in Paris, where he came under the influence of French plein-air painting. He was elected Associate of the Royal Academy in 1895, and a full Academician in 1906. As Professor of Painting at the RA his popular series of lectures were later published as Six Lectures on Painting (1904) and Aims and Ideals in Art (1906). During WW1 Clausen was an official war artist. His painting ‘Youth Mourning’ (Imperial War Museum) was a response to the horrors of the First World War and, in particular, the death of his daughter’s fiancé at the front. Clausen was knighted by King George VI in 1927 after the completion of his large mural painting at the Palace of Westminster, ‘The English People Reading Wycliffe’s Bible’. This work was untypical; the English landscape and rural life was his true metier. However he was also an accomplished and successful portraitist. Clausen’s work has consistently enjoyed a high public and critical reputation, and is represented in many public collections, including Tate Britain, the Imperial War Museum and the Royal Academy. His work was primarily concerned with landscape and ‘the life of the country labourer, his actions and the land he works on … a literal truth raised to a higher power by his sense of design and his lyrical feeling for the beauty of light.’ (Hussey, D., George Clausen, London, 1923). In D. H. Lawrence’s The Peacock (1911) Clausen is described as ‘a real realist; he makes common things beautiful, he sees the mystery and magnificent that envelops us even when we work menially’. In a long and prolific career, Clausen’s work never became formulaic or repetitive. He was always open to new artistic influences, one reason for the popularity of his RA lectures. His achievement was acknowledged by honours bestowed in his lifetime and since his death by exhibitions and monographs. The first major retrospective exhibition was in 1980 at the Royal Academy (and also shown in Bradford, Bristol and Newcastle). In 1979 the Fine Art Society’s exhibition The Rustic Image, exploring rural themes in British Painting, featured 80 pictures by 42 artists, of which nine were by Clausen. In 2012 the Fine Art Society staged an exhibition, also called The Rustic Image, devoted entirely to the works of Clausen. The catalogue introduction speaks of his ‘central importance in British art at the turn of the twentieth century’. The exhibition was timed to coincide with the publication of a major new biography, George Clausen and the Picture of English Rural Life, by Kenneth McConkey (Atelier Books, 2012). Clausen lived at Carlton Hill from 1905 until 1940, and depicted it (inside and out) on many occasions. McConkey writes (FAS catalogue, p.78), that ‘the calm of north London suburbia in particular, and views from his house in Carlton Hill became a constant theme. The first of these, ‘From a London Back Window in Winter’ (unlocated) appeared at the RA in 1910 and the series continued until 1940 when ‘My Back Garden’ (Tate Britain) was purchased by the Chantrey Bequest. 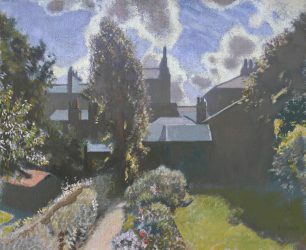 Clausen was fascinated by the fall of winter light on what Laurence Housman described as ‘the dull domesticity of the back streets of Maida Vale’, where the combination of flat windowless walls took him on a journey into abstraction’. ‘My Back Garden’ was painted when Clausen was 88, shortly before he left London for Berkshire to escape the Blitz. Clausen died in 1944 and is buried alongside his wife Agnes Mary at St Mark’s church, Cold Ash, near Newbury, Berkshire.